Home>Music> What Lil Uzi Vert’s "Sanguine Paradise" & "That’s A Rack" Tell Us About "Eternal Atake"
The road to Lil Uzi Vert’s Luv is Rage 2 followup has been a long one. Though a two-year gap between releases was once fairly standard, it might as well be an eternity in the streaming era— especially since, prior to this, the longest fans ever had to wait between Uzi projects was around six months. All of this culminated with Uzi announcing his retirement from hip-hop back in January, claiming he was “done with music” and even going so far as to state that he “deleted everything,” implying Eternal Atake as we know it no longer existed (we can only hope that by “deleted” he meant “scrapped” and not “obliterated from his hard drive"). Still, as any rap fan knows, most artists who formally announce their retirement don’t tend to stay retired, and a few weeks back Uzi posted an Instagram story that read “Back in the studio, thanks Roc Nation” with a since-removed single titled “Free Uzi” being upload to Tidal soon after. It’s hard to say how much of Atake’s holdup and Uzi’s alleged retirement was due to Atlantic holding the music hostage until he found a viable single and how much of it was simply because Uzi wasn’t happy with how the album was turning out. Luckily, after dropping two new singles last night, it seems as if the album’s release cycle has finally begun, thanks in part with his new partnership with Roc Nation. You can listen to "Sanguine Paradise" and "That's A Rack" and read our takeaways from the songs and their rollout below. Prior to the streaming era, artists largely banked on the success of a hit single to get people to purchase their album. Though singles are still vastly important in 2019, the way in which an artist chooses to utilize them has changed drastically. Of course, there are still many artists who go the traditional route and try to find a hit before locking in their release date, but many others choose “nontraditional” routes. Some drop a song from the album a week or two before it drops as a way to announce the project, others forgo singles altogether in favor of the fanfare of a surprise drop. Over the past couple years, however, it’s become increasingly popular to release multiple singles at once. It can be a little more difficult to pinpoint the exact reasoning behind an artist dropping two, three, or even four singles at once—for example, last summer Chance the Rapper dropped four “singles” simultaneously (isn’t that just an EP?) and then two more a few months later—all with no album on the horizon. It’s possible this strategy might just be a version of the patented “throw everything at the wall and see what sticks” model many rappers use when they drop two hour, 25-song albums. On the other hand, dropping multiple singles at once makes complete sense for a three-disc album like SR3MM, which showcased the members of Rae Sremmurd both as a group and as solo artists. Uzi tends to be a little more of an enigma, moving quietly and with precision, so the “throw everything at the wall” theory doesn’t seem to make much sense. It’s much more likely that Uzi decided on a simultaneous release for these two songs to give us a taste of what’s to come on Eternal Atake while also appeasing fans who’ve been (im)patiently waiting for new music since Luv is Rage 2. Despite constant delays and his alleged retirement, “Sanguine Paradise” makes it clear Uzi never lost his vigor. The word “sanguine” is defined as “optimistic or positive, especially in an apparently bad or difficult situation,” and Uzi has always been a master of effortlessly flipping between feelings of destitution and hope. Even beyond this specific situation regarding his label trouble, the term “sanguine paradise” is a perfect description of how Uzi depicts his life and feelings through music (the word "sanguine" can also mean "blood red," which is also fitting for Uzi). If “Sanguine Paradise” could be described as “urgent and triumphant,” “That’s A Rack” sounds more atmospheric and ethereal. Uzi’s experimented with a wide variety of production since he broke out with the original Luv is Rage, and if these two singles are any indication, Eternal Atake will continue to see Uzi expand upon this musical scope. Similarly, as a disciple of Young Thug, Uzi has always pushed the limits on how far he can manipulate his voice to convey a specific emotion or feeling. This is especially evident on the second bridge of “That’s A Rack,” where he stretches his vocals into a falsetto that invokes an almost nonchalant exasperation. Oftentimes, the more unconventional Uzi’s music gets, the better and more interesting it turns out, so if this trend is anything to judge by, the vocal inflections on “That’s A Rack” point to him furthering his range for the better. 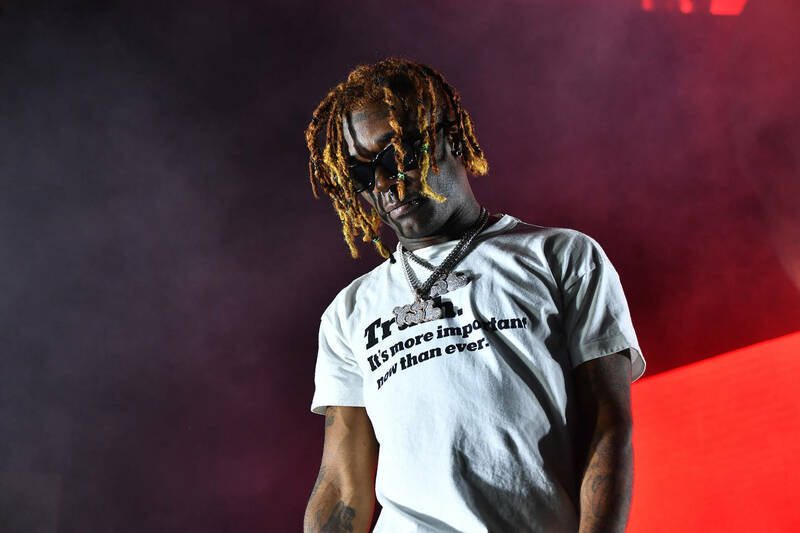 Even with the exploration of new flows and the general moody-ness of both songs (which hint at Uzi's emotional state as a whole), there are still familiar elements in both records that harken back to his previous mixtapes. The melodic piano keys in "Sanguine Paradise" could be reminiscent of "Money Mitch" or the bouncy "Super Saiyan," and purvey Uzi's penchant for thinking outside the "Soundcloud Rap"-box when it comes to his production choices. This could be the perfect formula for Uzi's new album: not a complete "return to form" but an evolution that carries some of our favorite elements in-tact. What do you think of the double release? Check out what fans are saying here. MUSIC What Lil Uzi Vert’s "Sanguine Paradise" & "That’s A Rack" Tell Us About "Eternal Atake"